“The Tigers are drugged, it’s so cruel!” Is what I heard time and again about the controversial Tiger Tourism of South East Asia (& particularly Thailand). I was really undecided on what I was going to do. 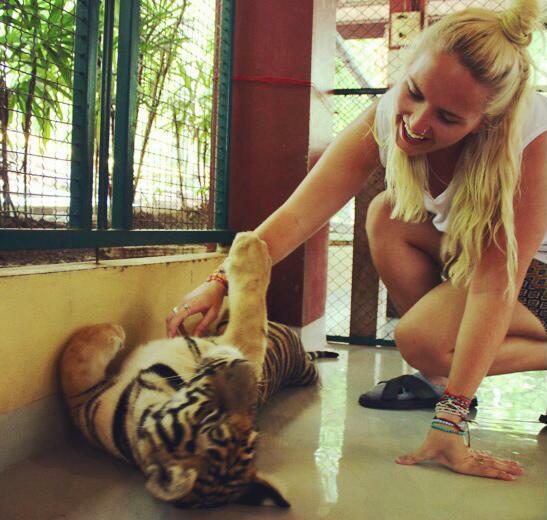 I love Tigers but I didn’t want to support an industry that drugs animals for the sake of tourism. Alas, I decided to experience it for myself. This is what I discovered. Whilst in Chiang Mai, our last stop in Thailand, we decided to visit Tiger Kingdom (also located in Phuket and Bangkok). We were really undecided about doing this. We’d heard from multiple sources that the tigers were drugged, something we were entirely against. But after reading this company’s website, which promised the Tigers were not drugged and merely hand raised from birth and naturally sleepy animals, we decided to give it a go. You can choose from four sizes/ages of tigers. We decided that if the Tigers really weren’t drugged that we’d go with the smallest, to be safe. The tuk tuk cost us $3 each for a return trip, with the driver happy to wait in the car park for a few hours whilst inside. What a deal! After washing our hands and wearing special shoes to eliminate spreading germs we were allowed into the enclosure. We got to spend about thirty minutes (we were told fifteen so it was a pleasant surprise) in the enclosure with the Tigers. It was incredible, they are such beautiful and clever animals. We are so glad we chose the smallest Tigers as they were still almost as long as us. They were quite playful, especially when you tickled them, when they weren’t sleepy. They did like to sleep but it definitely didn’t feel like it was an unnatural sleep. Anyone who has a cat as a pet knows that cats are lazy and sleep a lot (I think mine sleeps for at least twenty hours a day)! After our time was up we went and admired the littlest Tiger cubs, only a few weeks old, from outside their enclosure. The venues vet was inside with them, letting them climb all over him in order to get them used to being around humans. They were absolutely adorable. They could barely walk, their feet sliding all over the floor and they made the cutest noises. They’d come right up to the enclosure walls and let us stroke their heads. Their was a sign flashing common questions and answers with one saying ‘No, you cannot buy a Tiger,’ obviously everyone loves them a bit too much. Afterwards we went walking around the rest of the park, admiring the White Tigers, admiring the Lion (why they had a lone Lion in a tiger kingdom, I don’t know) who if we wanted we could have stroked through the cage he was so close and loved watching the bigger Tigers play in the pool they had. We all definitely agreed that these Tigers were not drugged, as the venue states. They were too playful and energetic. Watch this video and see for yourself how playful they were. My verdict? 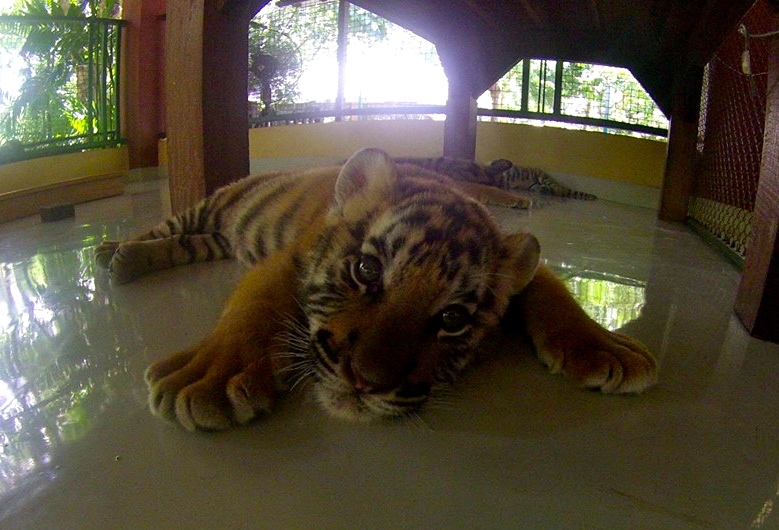 Avoid Tiger Temple and other institutions that drug and chain the Tigers. 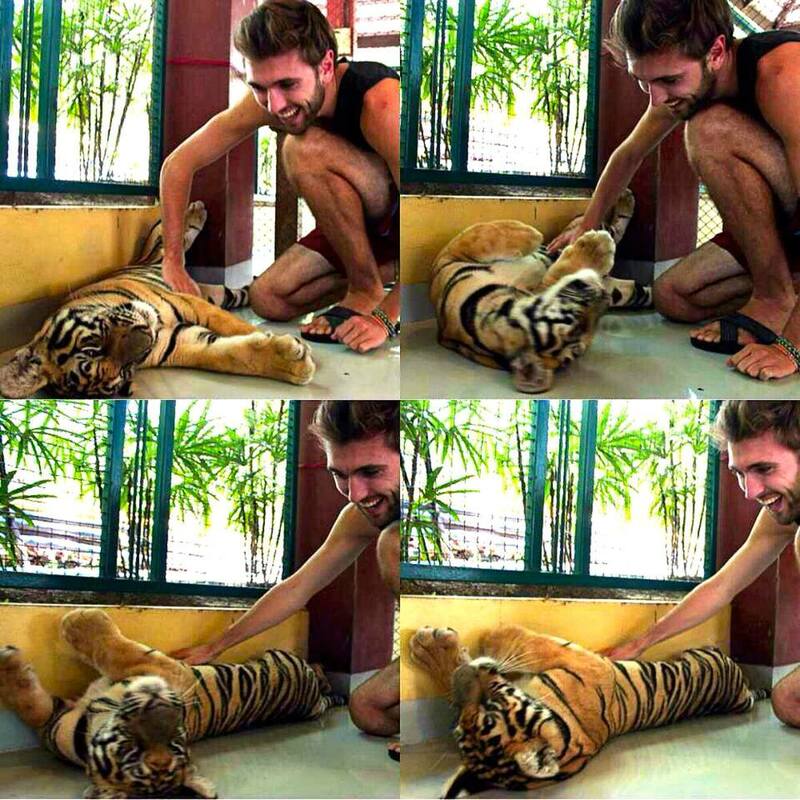 If playing with un-drugged, hand-raised and playful Tigers is on your bucket list? Visit Tiger Kingdom. I truly believe this is the best place you should do it. At least in Thailand. What is your verdict on this very controversial subject? Have you been? Would you go? You make valid points Louise and I respect your opinion and your right to express it but let me ask you- do you eat meat, drink dairy, ride horses, wear leather shoes, go to the zoo or aquarium? Why are there rules for one animal but not others? Just curious. Thanks for the read! How much did this cost you? This is a really interesting read. 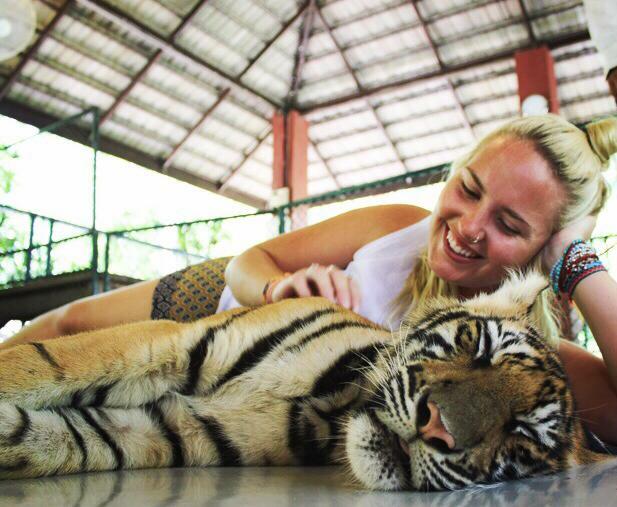 I too have only heard and seen terrible things about these places – tigers are my absolute favourite animal in the world and no matter how much I’d love a cuddle I could never bring myself to visit places like this. Interesting to read your experience though – I think its a very obvious thing to see if an animal is drugged or not. I’m planning to go to Chiang Mai in February… might look into this more. I can always leave if I don’t feel comfortable. But so good you had a lovely experience – these photos are gorgeous! Thanks Amy! It is such a tough topic, we agonised over the decision to visit for weeks and weeks but I’m glad we did. I don’t think there is a right or wrong answer in things like this. Glad this gave you something to think about!